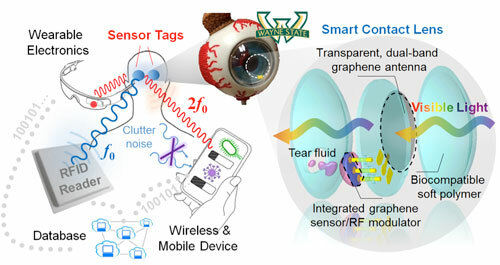 (Nanowerk Spotlight) Several research projects are working on reinventing the contact lens as a smart electronic device that, for instance, works as a self-powered biosensor for various point-of-care monitoring and wireless biomedical sensing, which may detect in real time the pathogen, bacteria, glucose, and infectious keratitis present in tear fluid. One example is a recently developed sensor for diabetic and glaucoma diagnosis. In addition to sensors, researchers are devising numerous applications for smart contact lenses, ranging from drug delivery systems to protection from electromagnetic wave damage. An application closer to contact lenses' original function, graphene can change the focal length of a polymeric soft contact lens in order to adjust near- and farsightedness. That means a single contact lens could be multifocal because an active graphene membrane can change its curvature reversibly from flat to a concave or convex shape under an electrical bias. Due to the mass impermeability of a pristine graphene lattice, graphene also can mitigate ocular dehydration. Even picture-taking and scanning with contact lenses is not a scene from a science fiction movie anymore. Scientists have developed a graphene light detector has the potential to put heat vision technology into a contact lens. Going a step further, researchers have demonstrated stretchable graphene-metal nanowire electrodes that enable LED fitted soft eye contact lenses. A recent paper in ACS Nano ("Smart Reinvention of the Contact Lens with Graphene"), by Kyoungjun Choi and Hyung Gyu Park from ETH Zurich, briefly reviews and describes prospects for the future of smart contact lenses that incorporate graphene in their platforms. The article specifically discusses a recent paper in ACS Nano ("Smart Contact Lenses with Graphene Coating for Electromagnetic Interference Shielding and Dehydration Protection") that demonstrated extended function of the smart contact lens by coating one side of a hydrogel lens with graphene to protect the eyeball from both strong electromagnetic wave (similar to the 4G and Bluetooth communication frequencies) damage and dehydration discomfort. 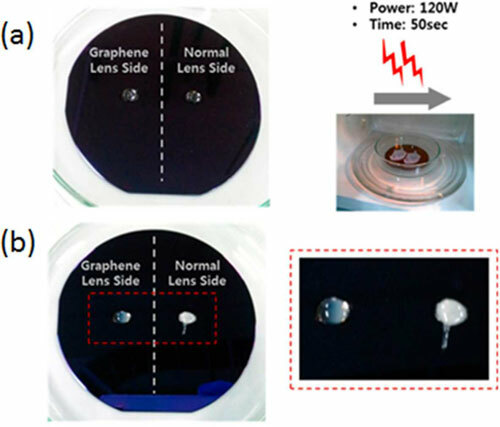 An electromagnetic interference (EMI) shielding effect is a promising feature of graphene use in a smart contact lens. In order to facilitate data communication and power charge, a wireless antenna interacting with electromagnetic waves is likely essential for the smart lens; however, continuous exposure to electromagnetic waves may harm eyeballs by low-temperature burns or dehydration (in an experiment, researchers showed that that egg white underneath a normal soft contact lens was damaged in a microwave oven). "In the future, smart contact lenses could be widely used to monitor and to diagnose diseases continuously," the authors conclude. "If equipped with actuator functions, they could also be adapted in therapeutics such as an ocular drug-delivery platforms. Furthermore, lenses equipped with a display application will be able to provide augmented reality as the on-demand information will be projected directly in the field of view."